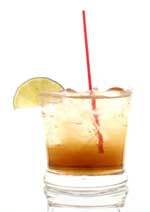 Tigers Blood drink recipe made with Lemon Lime Soda,Rum,. How to make a Tigers Blood with all the instructions and ingredients. Dragon Blood View This Recipe! I would have to guess that you'd need to add grenedine to get the red colour?? Though with the pop and grenedine together it would be too sweet. Or would it be tomato or Clamoto juice to get the saltyness?? This way you'd get the colour and saly taste together.